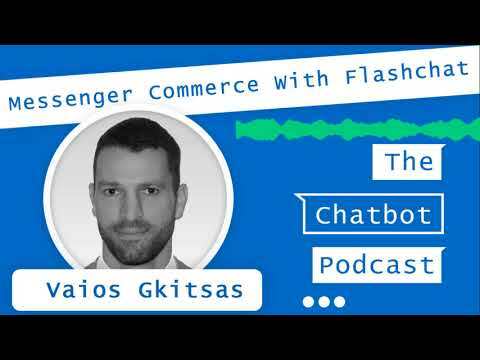 During the dark times of the embargo, we talked to Vaios Gkitsas about his company Flashchat, which is an “All-in-one Messenger Commerce Platform for retailers” and has been trusted by big brands such as Coca-Cola and Peugeot. His mission is to “make Messenger Commerce mainstream — and make it easy for any business”. Vaios has a lot of experience in automated marketing, and he’s helped businesses for over a decade to automate communication with their customers. He says a lot has changed since he specialized in SMS marketing, and that now is the first time mobile commerce can really “take-off in a big way”, due to the ‘industry-disrupting’ effectiveness of Messenger Marketing and Chatbots. Many valuable tidbits you can get from this episode from a guy who’s been ‘in the trenches’ with automated marketing for 15 years. He also explains really clearly the problems his Chatbot platform solves for retailers and the value of Conversational Commerce in general. Start your free trial with Flashchat! We also have a quiz on Messenger Marketing, you might be interested in.